Although there haven't been many updates lately, we haven't been inactive. The spellbook is one of the things that differentiate The Battle for Middle Earth series from other strategy game franchises, and presents the opportunity to integrate things into the game that wouldn't fit otherwise. However, we haven't been happy with how the spellbook has been implemented for a long time. Because of this, one of our goals since at least 4.0 was to get away from the spell battles, in which the armies only played a negligible role. Especially during longer games it rarely was the case that battles were decided without the support of the spellbook. Instead of using the spellbook powers with some afterthought and waiting for the right moment to tip the scales with them, they were often used at the first possible opportunity, because a new one was already ready to go for the next battle. Instead of supporting the playstyle of a player, the use of a single spell can often decide the match. With the release of 4.0 we already took some steps towards changing this; but with 4.5 we have taken our time changing the spellbook in bigger ways we deemed necessary. The spellbook consists of many single spells that are divided into different levels where buying the spells in the upper row unlocks those in the lower rows. This begs for some questions, if you give it a second look. Why do spells unlock those under them instead of unlocking all the spells in the next row? A logical reason would be the spells building onto each other, so it'd make sense for the player to only be able to buy them in a certain row; however, this is not currently the case. In fact, the spells have always been arranged rather arbitrarily. At the same time the structure of the spellbook often influences the usefulness of certain spells. A spell at the edge of the second row was decidedly less attractive to buy than a spell in the middle, as it left the player with less options to choose from. Vice versa, a spell could also become attractive purely through granting access to one of the "must-have spells" of some factions. A meaningful concept looked different. At the same time we wanted to take the chance to make the spellbooks more unique and adjust them to their corresponding faction. To be honest, the spellbooks never were really unique to begin with. The spells typically consisted of a small amount of generalized spells, sprinkled with a few ones that were unique to the faction. On top of that, each faction needed something to counter the weather spells and one spell for area control like 'Elven Wood' or 'Lone Tower', to also counter the enemy's area control spells. This resulted in the first half of the spellbook already being filled. Add to that troop summons that, at most, differed in the design of the summoned troops, and apart from a temporary boost to your army didn't add any strategic value. Finally there were the final spells that were supposed to be the high point of the spellbook and make the player choose which spell they should get first. This choice; however, was robbed of its meaning as it was a simple choice between 2 extremely damaging army killing powers. In addition, many spellbooks lacked real referances to their faction. While every spell fit in the faction thematically or historically, they never really contributed to the character or the playing style of the faction. Because of that we are completely restructuring the spellbook in 4.5. Instead of multiple branches, that go to the left and the right and don't necessarily follow a certain theme, you will now have access to two more distinctly divided trees. The left side represents the more defensive, long-term oriented branch and the right side the more offensive, short-term oriented branch with stronger aggression on the current state of the game. The player now has to choose whether to directly engage the enemy, gaining a proportionally stronger but temporary bonus, or to slow their attacks in favor of long term spells, whose effects not only grant an advantage in the next battle but also beyond that. Which path the player chooses might depend on a range of criteria: The enemy's faction, the player's own strategy or preferences, etc. The decision for one or the other path at the start of the game should be a deliberate one. As you can see, the two branches touch each other in the third row, allowing to change the branch. We don't want to limit the player too much to a single branch. This for example can help a pressured defensive player to get out of trouble if he needs some quick support. This switch allows the more players who have invested heavily in 1 side to follow the other path. Of course beginning both paths is another option but this comes at the cost of later access to the higher spells. 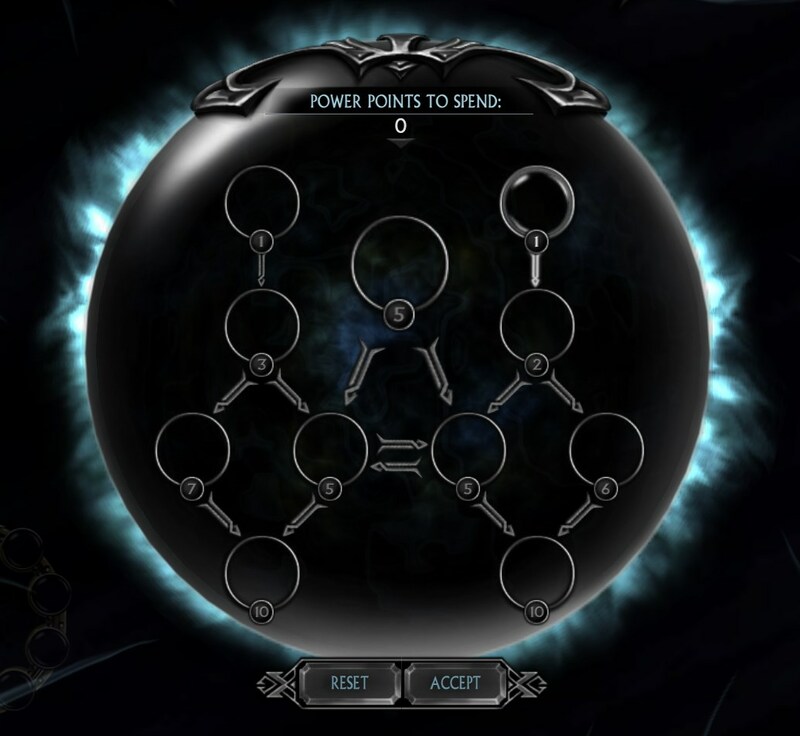 While the spells in the third row enable you to switch paths, the spells at the edges are stronger connected to their respective tree and also are proportionally stronger in their effect than those in the middle. So if you choose to not switch, you may instead choose one of the outer spells and enhance your designated strategy even further. Accordingly you also have to restart the tree from the top. Surely by now you have noticed the big spell in the middle? Some spells barely fit into one of the two trees, or are too important for the faction to miss if the player should choose the wrong tree. On the other hand, as we already stated above, one of our goals is to make the spellbooks more representative of the character and playstyle of the particular faction. Because of that each faction in 4.5 will have access to its own, unique Faction Spell. This might be a central element to the faction, an important character in the faction, or other unique theme. The Faction Spell is self-containing, can be bought without prerequisite and will cost around 5 spellpoints for each faction. Towards the lower part of the spellbook the central Faction Spell also gives access to the two middle spells of the third row, giving the player another chance in addition to the already presented options of switching the trees. More informationen to the new spellbooks of the factions will be presented in the next updates, and you also can look forward to seeing some new or reworked spells. We hope the new spellbook sparked your interest and look forward to your feedback!